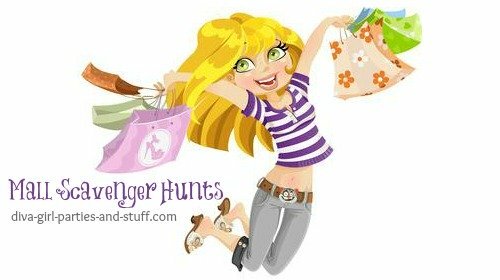 Every year my church hosts a womens' mall scavenger hunt for girls of all ages. It's a blast. We search for items, solve trivia, get dressed up in ridiculous outfits, and approach strangers for a variety of crazy reasons. We laugh, compete, bond and then argue out our finds for the winning points over appetizers at a nearby restaurant. We have many photos we threaten to put on Facebook and Twitter, but so far the pact is in tact... what happens at the mall, stays at the mall... expect the memories. They travel with us forever. Find the following items and bring them back. Any item that requires purchasing can be photographed instead - 2 pts each. A game that begins with "P"
Using ONLY $1.25 (including taxes), purchase the heaviest item you can find (must show receipt at weigh in). Team with the heaviest item gets 5 points. Find the answer to each of the following trivia questions based on information and items available at this mall - 3 pts each. How many stalls are in the food court ladies restroom? How many dressing rooms are there in Winners? What does it cost to rent a double stroller at this mall? Who is on the cover of this weeks People magazine? What does it cost to add bacon to your 6” sub at Subway? How many mannequins are there in the windows of the stores between Chapters and Victoria Secret? What are the pharmacy hours at Walmart on Saturdays? What movie is playing in Cinema #2? How many buttons does the Sears elevator have on the inside? Photograph the following scenarios. Photographer does NOT have to be in photos requiring the whole team - 4 pts each. Move the e of a delicious frosted pastry from the beginning to the end. Photograph your team in front of the resulting adornment shop so that its name is visible in the photo.